A lovely colourful inspirational print with the words 'Happy, Happy....' in bright rainbow colours. 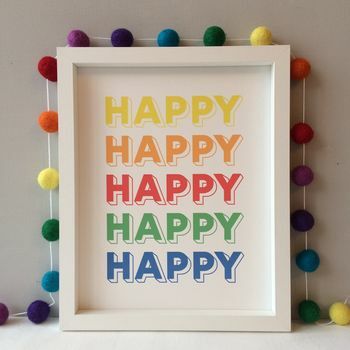 An unique gift that would look lovely on a bedroom or nursery wall. Also available 'You're Really, Really... Cool' print in matching bright colours. A perfect gift to brighten any wall! Designed exclusively for pluen. Available framed or unframed. Wooden painted frame, heavyweight artists' grade paper. This product is dispatched to you by pluen.